What had kept me from making the trip was the 17-hour flight, and most of it over all that ocean. To add to my dread, David booked a night flight. Imagination can be wonderful for an author, but your mind can also conjure up a lot of bad scenarios, all of which added to my anxiety. But my desire to see these countries finally outweighed my nervousness. 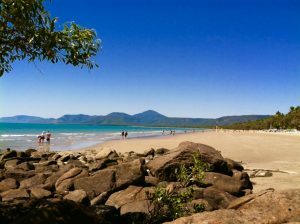 Photo: Four Mile Beach, Port Douglas, Australia. September 15, we boarded an evening flight from DFW International to Brisbane, Australia, and settled into our seats on the upper deck of the Qantas 747 Longreach. I occupied my time during the long flight the way I often do with my free time—writing the next book in my thriller series or the next blog post, enjoying every word I jot down—doing it the old-fashioned way by putting pen to paper. “I’m not interested in hauling along my laptop—too much trouble with all the security checks, never mind keeping close tabs on it. I seldom breeze through security these days, not after 911 and a knee replacement. I seem to be on everyone’s radar for a pat down, but I don’t mind—I’d rather arrive safe than not at all. After a late dinner of sea bass, broccoli, and pickled radish salad—not bad for airplane food—I dug out my notepad and set to work on writing blog posts. Hubby slept, a luxury I rarely indulge in during any flight—I’m too keyed up. And even though I had a window seat, I couldn’t see anything, as it was nighttime. To the sound of several passengers snoring, my gaze wandered to a burly man in a bright orange jacket sitting in an exit seat. He stood and observed the passengers. Federal marshal, I wondered? At some point in the endless flight, I must’ve dozed off. David tapped me gently on the arm and asked if I was interested in breakfast. No, I wanted to land, to feel earth beneath my feet. 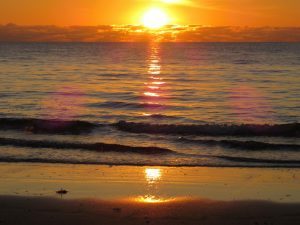 We finally landed in Brisbane at 5:00 a.m. on September 17, having lost a day when we crossed the International Date Line. In Brisbane, we had a five-hour layover, giving us ample time to clear customs and catch the train shuttle to the domestic section of the airport, where we boarded a 737 Air New Zealand flight to Cairns—a two-and-a-half-hour airplane ride, the best kind in my book since it’s short. I picked at my lunch, enthralled with the miles of neon-turquoise waters that shimmered below, the aqua surface dotted with coral reefs and broken by a sea inlet. Photo: Back of Peninsula Hotel facing Four Mile Beach. Our room was on the top level, blue section on the lefthand side. 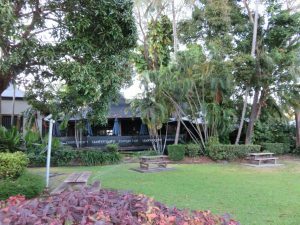 In Cairns, we had prearranged for a chauffeur-driven car to take us to Port Douglas, an hour-and-a-half trip north of Brisbane. Len, our driver, kept us entertained with suggestions for sightseeing and general folklore. As we motored along the east coast of Australia, I was stunned to see acre upon acre of sugarcane fields and commented about this to Len. “It’s one of our largest and most important industries. We grow up to thirty-five million tons of sugarcane every year,” he said. I had no idea Australia cultivated sugarcane, and on such a grand scale. The first time I had seen a sugarcane field was when we lived in Trinidad. Intrigued by Len’s comment, when I returned to the US I researched Australia’s sugarcane industry, which is Queensland’s largest agricultural crop and a billion-dollar business. The cane fields are located mainly along Australia’s eastern coastline from Mossman in the far north of Queensland to Grafton in northern New South Wales. There are approximately 4,400 sugarcane farms. The vast majority are owned by sole proprietors or family partnerships. Depending upon seasonal production, Australia is one of the world’s largest exporters of raw sugar, after Brazil. About 80 percent of the raw sugar is exported mainly to East Asia, China, Indonesia, Japan, Korea, Malaysia, Taiwan, the US, and New Zealand. The remaining 20 percent is for domestic use. Len dropped us off at the Port Douglas Peninsula Boutique Hotel, and we checked in. 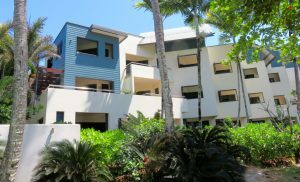 Our corner room was on the top floor, private and quiet, with two balconies: one overlooked Four Mile Beach and the other a narrow walkway that led to the beach. We unpacked, changed clothes, and strolled along the shoreline for about an hour before we freshened up for dinner at the Watergate Restaurant & Lounge Bar. The restaurant’s entrance is down a flame-lit path off Macrossan Street—romantic. We arrived early for our dinner reservations, so we sat in the lounge to sip a pre-dinner drink and to unwind. Per our request, our server showed us to an outdoor table. We felt as if we were eating in a lush rainforest, and as an outdoorsy person, I loved the setting. David ordered pan-seared local reef fish with crispy duck fat chips, sautéed greens, and a malt vinegar beurre blanc. One glance at the menu and I knew exactly what I wanted. Both of my favorites were being served together—duck leg with garlic mushroom risotto, and seasoned, parmesan greens. Dessert was also an easy choice. We shared a flourless chocolate cake with white chocolate ganache and roasted almond gelato. Photo: Watergate Restaurant & Lounge Bar. Photo right: Four Mile Beach at sunset. Next week: Australia 2014: Port Douglas—Part 2.